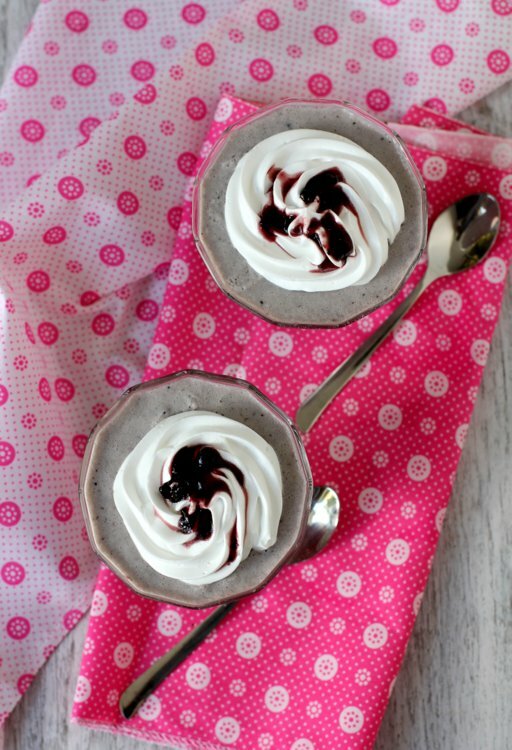 A delightful soft melt in the mouth mousse that is a hit with both kids and adults. 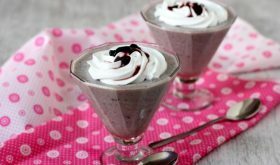 This mousse recipe which is eggless and gelatin free is prepared with agar agar and fresh cream. Agar-agar is a vegetarian gelatin and is made from a seaweed. 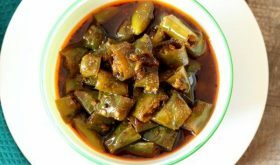 It has a mild flavor and is loved by vegans and vegetarians for its natural gelling ability. You are going to love this fruity mousse since its light, airy, smooth and sweet with the perfect texture. Soak agar agar flakes in hot water for 10 mts. Place the soaked agar agar (or bloomed gelatin if you are using it) over the vessel of simmering water and stir until combined. The agar agar will melt and become a clear mixture with no lumps. Turn off flame and allow to cool for 4-5 mts. Ensure that it does not become solid and stays in liquid stage. Add the blueberry preserve to the the agar agar mixture and mix. Allow to cool. While the mixture is cooling, whip the fresh cream and sugar over a bed of ice cubes till firm peaks form. Remove 1/4 of the cream into another bowl and place in fridge so that you can use it later for garnish. Using a long stainless steel spoon, gently fold the whipped fresh cream into the blueberry mixture ensuring that you do not deflate the air. Divide the mousse equally between 4-5 glasses, cover with cling film and refrigerate for at least 4 hours or till set. Garnish with fresh cream and a dollop of blueberry preserve or few fresh blueberries and serve. If using fresh blueberries, puree them. Place the puree in a vessel, add 3 tbsp of sugar and cook on medium flame till it comes to a boil. Reduce flame to low and cook for a few mts and turn off flame. Allow to cool and use as called for in the recipe. You can use 1 cup heavy whipping cream like Tropolite in place of fresh cream. Before beating the cream, keep the bowl and whisk/beaters in freezer for 20 mts so that they are chilled. Ensure that the fresh cream or heavy whipping cream is very cold before whipping. If using gelatin, place it in cold water for 10 mts to bloom. 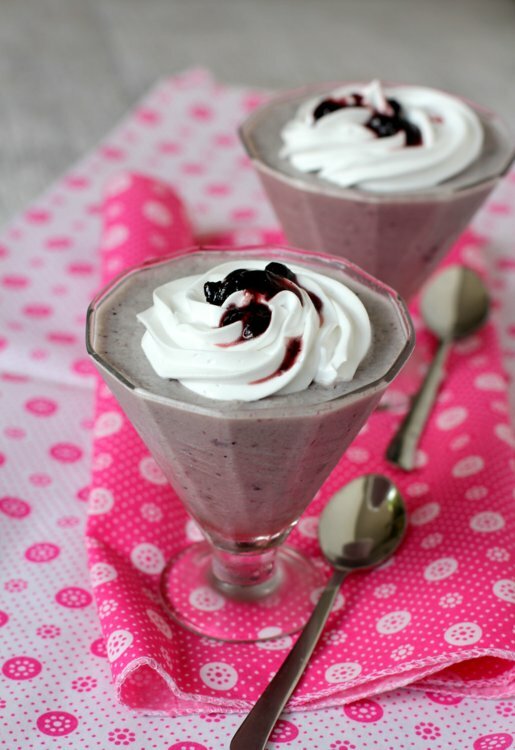 Blueberry mousse looks very tempting! Can we use Mala’s Blueberry crush and in how much Quantity. Also, Can we use Merry Whip non dairy topping that we use for cake icing? Yes, you can use Blueberry crush – 3/4 cup. Merry whip can also be used. Thanks for this !! Is china grass and Agar Agar the same ? can you please let me know where do I get preserved blueberries in Vizag?